A couple of weeks ago, I was contacted by Peanut Butter & Co. They wanted me to try some of their peanut butter flavors. When the box arrived at the door, I was amazed to see these inside. That’s eight different types of peanut butter! 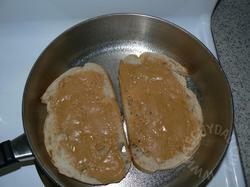 Now, I’m already familiar with Peanut Butter & Co. I’ve had a few of their peanut butters and love them. I own their cookbook. And while I’ve never been to their store in New York City, I hope to go during BlogHer. (Anyone up for a PB-lunch break/meetup during BlogHer?) I decided that I was going to use each of their peanut butters in its own dish and write a Cooking With TechyDad segment on my creations. My first creation I’ve dubbed the Veggie Elvis. It originated in the Peanut Butter & Co cookbook as The Elvis: a fried PB, banana and bacon sandwich that Elvis reportedly loved. Now, we keep kosher in our house so bacon was out. 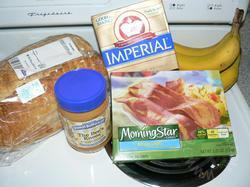 However, we do eat Morningstar soy bacon, aka Fakin’ Bacon, aka Veggie Bacon. I started by gathering my ingredients. 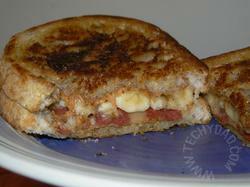 Veggie Bacon, bananas, butter, bread and the star attraction: The Bee’s Knees. 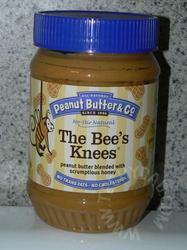 The recipe called for normal peanut butter and had honey as another ingredient so I figured why not use Bee’s Knees? After all, it has honey built in! 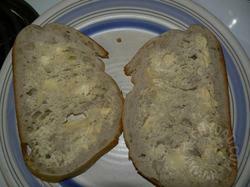 First I laid out the bread and put butter on one side. 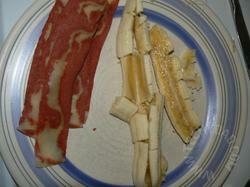 Then I cooked the bacon and sliced the bananas. 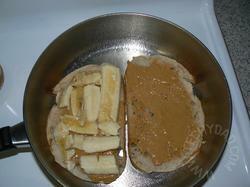 After this, I spread peanut butter on the unbuttered sides of the bread and placed it into a frying pan peanut butter side up. Note: This was the first sandwich I made. I discovered, upon subsequent sandwich making, that it was better to put the first slice down, put the closing slice on top later on and let the bread cook when flipped so it doesn’t burn. You’ll see what I mean in a bit. Now you top with the bananas. 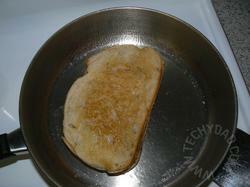 And the closing slice of bread (butter side up). Now you fry this for about 3 minutes, flip and fry for 3 minutes. Cut it open for full effect and doesn’t it look good? Don’t you just want one right now? B, NHL and I all loved this. JSL wasn’t thrilled but then again, if it isn’t Macaroni & Cheese or cookies, he’s never thrilled. If I made it again, I’d probably ditch the veggie bacon. 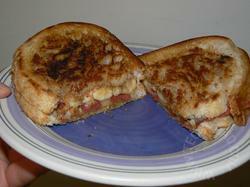 It wasn’t bad, but the peanut butter and bananas overpowered it to the point that you couldn’t taste the bacon strips. 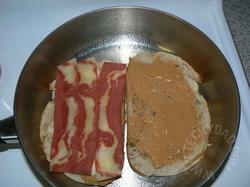 This might be different if you use real bacon instead of a vegetarian substitute. I’ll definitely be making this again, though! 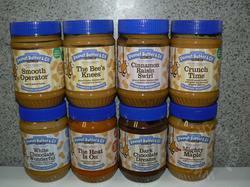 Wow, what an assortment….my daughter is a peanut butter freak! .-= Michelle´s last blog ..I Might Be MIA =-. Eight different kinds of peanut butter??? Now really … shouldn’t our food scientists be engaging their brains in something a little more beneficial to mankind … like a cure for cheese mold?